The Case of the Scorpion’s Tail (aka La coda dello Scorpione) is an Italian giallo horror thriller from 1971. Beautifully directed by Sergio Martino, who is no stranger to the giallo genre (The Strange Vice of Mrs. Wardh and Torso), the film has all of the elements that made giallos so great during that era, such as blackmail, gratuitous violence, and romantic scenes. It’s also one of a few giallo films to be an Italian-Spanish co-production, and was partially filmed in Greece. The story begins when an unhappily married woman named Lisa (Evelyne Stewart) receives a phone call informing her that her husband Kurt (Fulvio Mingozzi) has been killed in an airplane explosion. Wanting to cash in on his million-dollar insurance policy and flying to Greece to be with her lover George (Tomas Pico), her plan is thwarted when an insurance investigator (George Hilton) and a reporter named Cleo (Anita Stringberg) show up to inspect her. Murders begin occurring, including an attempt on Peter’s life, when an Interpol agent (Alberto de Mendoza) and an inspector (Luigi Pistilli) get involved, taking everybody down a startling and disturbing path. The Case of the Scorpion’s Tail is an excellent giallo, both highly atmospheric and creepy. Director Sergio Martino keeps the story moving at a methodical pace, building tension and ultimately leading to a highly suspenseful conclusion. Bruno Nicolai provides an excellent musical score, adding to the eeriness of the film, with some of the music being reminiscent of Ennio Morricone, which should come as no surprise as they were friends and co-scored a few films together. Having owned the previous DVD of The Case of the Scorpion’s Tail, this new release from Arrow Video is a major upgrade. It’s presented in its original aspect ratio of 2.35:1 with a “brand new 2K restoration of the film from the original camera negative.” The results have made the film look better than it ever has, appearing brighter, clearer, and more polished than before. Colors are absolutely vivid, with reds and blues looking especially sharp. Skin tones also have a natural look to them. Daytime scenes look fantastic, especially during the film’s conclusion where the ocean scenery and skyline look magnificently crisp. Nighttime scenes also look terrific with deep black levels. Film grain is present throughout and no DNR passes appear to have been applied. Audio options include English and Italian mono LPCM, as well as newly-translated English subtitles for the Italian track and subtitles in English SDH for the English track. Both audio tracks sound perfectly fine without hiss, pops, or dropouts. They have a subdued, mellow feeling, with nothing really jumping out aggressively. Arrow Video has also outdone themselves once again in the extras department, with an ample amount of bonus features. They have incorporated material from previous releases with brand new supplements, including new interviews with George Hilton and director Sergio Martino, which are in Italian, but subtitled in English. Also included is an audio commentary with writer Ernesto Gastaldi, which is moderated by filmmaker Federico Caddeo and presented in Italian with English subtitles. Under the Sign of the Scorpion is a 20-minute interview with Goerge Hilton in which he reflects about the film, as well as members of the cast (including a funny bit about Anita Strindberg) and the crew. He also discusses his career in film, how he transitioned himself from doing westerns to giallos, his personal life, and how he feels about films today. Director Sergio Martino’s 47-minute interview, Scorpion Tales, includes his reflections and insights about the making of the film, stories about the cast and crew, and what he would have done differently if he were to remake the film. Jet Set Giallo, another new supplement, features author Dr. Mikel J. Koven of “La Dolce Morte: Vernacular Cinema” and the “Italian Giallo Film”. He shares his thoughts and viewpoints about the genre with some background on characters in Sergio Martino’s films, including this one. The Case of the Screenwriter Auteur is a very informative audio essay from film historian Troy Howarth, who elaborates on the value of giallo screenwriters, particularly the career of Ernesto Gastadi, and what he contributed to films directed by Sergio Leone. Rounding out the extras is a theatrical trailer, an image gallery, a reversible sleeve featuring original and newly-commissioned artwork by Chris Malbon, and with the first pressing of this release, an illustrated 40-page insert booklet featuring the essays “Re-evaluating The Case of the Scorpion’s Tale: Sergio Martino’s Hitchcockian Giallo” by Rachael Nisbet, “Out of the Shadows: The Film Music of Bruno Nicolai” by Howard Hughes, “Anita Stringberg: Elusive Icon of the Giallo” by Peter Jilmstad, and restoration details. 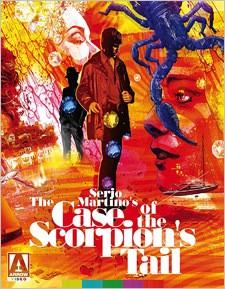 For those wanting a definitive release of The Case of the Scorpion’s Tail, this presentation from Arrow Video is about as good as it’s going to get. It’s wonderful to see this film receive such majestic treatment. Many kudos to Arrow for their efforts. Highly recommended!